After a few weeks of more play than hard work, our prospective scouts decided that they wanted to be scouts after all. So on the 24th of April 2009, Graham, Melanie, Ivanka and Amber were invested into the 1st Paarl Troop as our newest scouts. On the day they looked nervous, not knowing what to expect. The hall’s lights were switched off. It was completely dark. With only candle light guiding them, they moved towards the waiting scouters and scouts where they were asked to recite the scout promise. Eddie took some time explaining to the new scouts just what was expected of them, what the scout promise and the scout law meant and how they should make this part of their normal daily lives. The new scouts have taken to their role very nicely and we expect them to uphold the promise they repeated, along with the Scout law and motto. It is really great to read of the 1st Paarl on this web site. 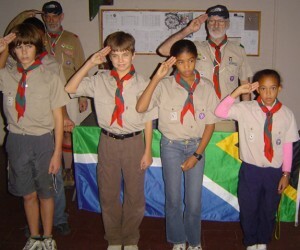 I had the pleasure of visiting the troop HQ in 1989, and was taken of a tour of the pioneering projects carried out in the Paarl Mountains, sadly I never got photo’s of them but have often referred to them as an example of what can be done, and still have on my camp fire blanket the Western Cape badge I was given on that occasion. Well done 1st. Paarl, it is good to see the old traditions live on..